My heart was full of bitterness when I read about the unwarranted arrest of Biafran women who were peacefully protesting, on Friday 17th August 2018, in Owerri, Imo state, the whereabouts of Mazi Nnamdi Kanu, the IPOB Leader whose whereabouts remain unknown after the invasion of his home residence by the Nigerian military on the 14th of September, 2017. Considering the fact that the women have been denied freedom, I feel more embittered, and to avoid leaving my feelings as mere sentiment, I decided to consult the Constitutions of UN and Nigeria in order to ascertain how wrong the women were in organizing a peaceful protest, and how right the security operatives - police - were in arresting, and detaining unarmed, helpless women. The UN General Assembly charter on the Universal Declaration of Human Right(UDRH) article 20(1) reads: "Everyone has the right to freedom of peaceful association while article 5 reads: "No one shall be subjected to torture or to cruel, inhuman or degrading treatment or punishment." Also, the right to freedom of assembly is enshrined in Nigeria's 1999 constitution, sections 39 and 40 as well as in article 11 of the African Charter on Human and People's Rights. With respect to the above, my question is: why is Nigeria unable to obey, for once, a Law enshrined even in her own Constitution which also is recognized globally? Or is it because the people at the receiving end are Biafrans? The above question is factual YES because when youths from the North protested in Abuja for the release of the detained Sunni leader, no one was shot dead. UN Charter - article 7 - clearly states thus: "All are equal before the law and are entitled without any discrimination to equal protection of the law." Then, where is the implementation of the above 'protection without discrimination' when, in Nigeria, some tribes are treated like kings and others like slaves? Or is what is good for the goose not good for the gander anymore? 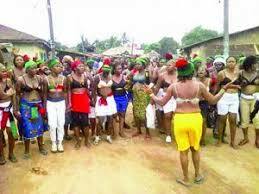 I, therefore, call for the immediate release of the unarmed Biafran women with an in-depth apology rendered to them.